Aside from gas blowouts, stuck drill strings are one of the greatest operational risks in offshore directional drilling. 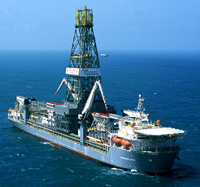 As drilling ships can cost in excess of US$1 million per day to keep on station, our client, an international upstream oil and gas exploration organisation were concerned about reducing the significant annual cost of this major cause of operational downtime. As the outcome of an internal research programme on the problem had proved inconclusive AGILE8 was asked whether an alternative knowledge discovery based approach might provide a solution. AGILE8 consultants worked with our client to understand the content of a large volume of data gathered during offshore directional drilling operations at numerous locations. This real-time, measurement while drilling information included data on aspects including drill types, instantaneous drilling rates, the diameters of drills, collars and risers, drilling mud consistencies and weights, drilling angles and chloride levels. We next used Insight©, our knowledge discovery solution to identify and isolate 'outliers’, or apparently erroneous information from the main body of this real-time measurement data. We then used the Insight© Zeus engine to generate an initial set of 'business rules' for drill stiction using data from an intermediate depth offshore drilling site. Consultants next used the Insight© validation module to verify the 'goodness of fit' to business rules of data from other offshore drilling sites. A final step required formal approval of the derived 'business rules' with our client’s geophysics and offshore directional drilling specialists. In this final stage AGILE8 consultants made use of the Insight© prediction module to demonstrate the validity of 'business rules' when used with data from other offshore directional drilling projects. The presence of 'noisy', erroneous data had hampered earlier attempts to arrive at a solution. Using Insight© our joint client and consulting team was able to show that limiting the drilling angle during the initial stages following the Kick Off Point (KOP) significantly reduced the risk of stuck drill strings. The derived business rules, once agreed were subsequently put into operation. The benefits to our client, in terms of reduced downtime in offshore oil & gas directional drilling operations were estimated to be in excess of US$350 million per annum.